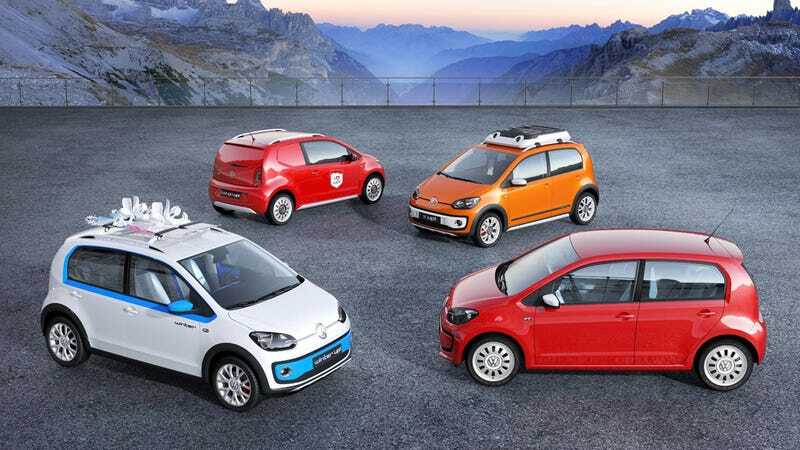 VW has sent out an unbelievably upbeat press release for its four new up! design studies: the swiss up!, the winter up!, the x up!, and the cargo up!. Silly names, right? The swiss up! just looks like it's baiting for some swiss army knife-related puns, but the real joke is that it's just a lifted VW with a fancy paint job and some interior trimmings. The winter up! is a more substantial concept, with a raised ride height and some underbody protection to make the little front-driver more capable in the snow. This could mean more than the one-inch lift on the swiss up! and VW's old cross up! concept, but we don't yet know. You also get some roof-mounted snowboards and new paint and trimmings. The x up! gets the same one-inch lift as the swiss up!, but also roof-mounted lights and bright orange paint. It's supposed to be for night expeditions, says VW, but why wouldn't you want a bright orange lifted city car all the time? Finally, there's the cargo up!, which loses the rear seats, but gains a plexiglass divider between the driver and cargo areas, as well as body-colored rear windows that you can see out of, but people outside can't see into. We actually kind of want to drive this little three-door capable of hauling 940 pounds. We don't know if VW is planning on building any of these up!s, or if they're just designed to show off the platform's potential utility, but we'll ask Volkswagen when they debut at the Geneva Motor Show next week. If anyone is even interested in us asking the question.